Contemporary business requires an organization to consider not only what a record or asset means now, but what it represents in the future. Companies must deploy a process today and account for it tomorrow across all aspects of their business. Each business is a mechanism to provide products and services as well as the creator of information to identify effective policies. To be successful, a business must be a responsible custodian of that information. 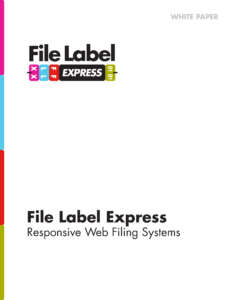 File Label Express brings a unique combination of experience in records and data management, document conversion and cutting edge software development. Our team consists of developers and designers that know how to make software that people love to use.